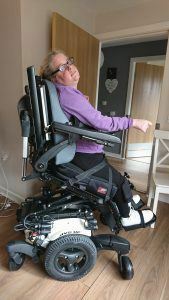 Elifar part-funded this sit-to-stand wheelchair for 26 year old Charlotte who has quadriplegic cerebral palsy and is registered blind. She is outgoing and takes part in various local activities such as drama, cooking, and as a DJ with a community radio station. Charlotte was funded by the local health service to purchase a new basic powered wheelchair. Elifar contributed £5,000 towards the extra £9,980 required to enable the chair to have a sit-to-stand function. The new, sophisticated wheelchair will allow Charlotte to sit, stand and lie down. She can move around more easily and adjust her position. The facility to stand offers extensive health benefits and enables her to join in more fully with a range of activities. It will also allow her to be more independent.